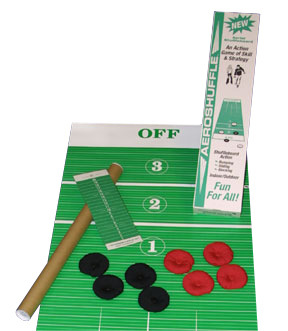 Aeroshuffle is a game of skill and strategy with a touch of luck. Players may find themselves in tricky situations, but they're never out of the game - or the action. 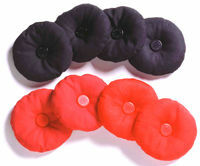 The soft bean bag discs are filled with non-toxic high density polyethylene pellets and sewn with heavy duty thread. The fabric is a polyester / cotton blend that is both durable and colorful. The central button, that gives the disc its unique bumping ability, is statically welded in place. The new patented soft discs are safe for kids and provide incredible tossing, bumping and sliding action. Each set consists of 4 red and 4 black soft discs and come in a plastic drawstring bag for easy transportation and storage. The 28" x 72" reinforced vinyl playing surface is colorful, durable and versatile. It can be set up in a variety of indoor and outdoor locations. It is beautifully silk screened with the 1-2-3 type shuffleboard format. The board is pinstriped for easy scoring. There is a heavy duty cardboard tube with end caps perfect for travel and storage. Use your own pennies, nickels or dimes to keep score. No scoring pieces to lose! On the back of the scoreboard are the rules of Aeroshuffle for easy reference. Laminated for years of use.